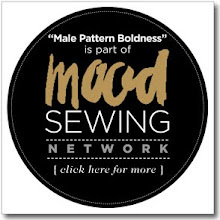 male pattern boldness: Men's Shirt Sew-Along 17 -- Penultimate Post and Negroni 3 REVEAL! The parting will be painful of course but you will discover there is life after sleeve plackets and camp collars; there must be. Rest assured that the sewing, posting, critiquing, and cheering can continue in our Flickr group, which will live on long after the formal Sew-Along packs up and moves on. I finished Negroni 3 yesterday and am quite happy with it, though my mother judged my fabric choice "silly." She was impressed with Michael's muslin, however (you'd think he'd made it). I believe it is quite normal for a mother to show a slight preference for all things son-in-law-related over the son. There's just less baggage. And speaking of baggage -- look who'll soon be joining the clutter family here at MPB Inc! 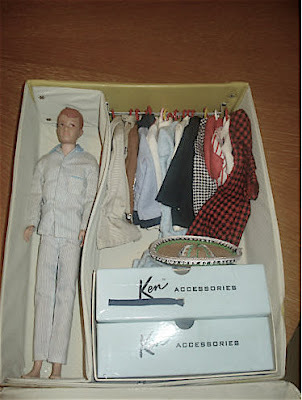 Ken's friend Allan and Allan's extensive wardrobe should arrive in the mail this week and what fun we'll have digging through it. Maybe I'll invite Sassy Lassy over for a play date! Yesterday I added the cuffs, which came out nicely. I had no trouble with the fold-down-outer-edge-at-3/8", stitch-other-side-to-sleeve-at-1/4" instructions but I know many people did. Either way we're talking the difference of 1/8", which is meant (I think) to compensate for the turning right side out and folding over, do you know what I mean? I think the hardest part is positioning the cuff on the inside of the sleeve and stitching without catching the other side. It is for me at least. You'll notice that instead of a single deep sleeve pleat I created two smaller ones, a look I prefer. I also hemmed the shirt, rolling up at roughly 1/4" and stitching and then rolling and stitching again. As I mentioned yesterday, I decided to leave off the pockets, which I think look better on a heavier fabric with a less busy pattern. It does lose of a bit of it's Negroni-ness, but that's OK. On this shirt I prefer it. More Negroni 3 pics here. 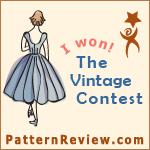 Friends, I think I am ready to put away my Negroni pattern for the time being; I have a crinoline to make. You guys have created made some wonderful shirts and truly challenged yourselves with fit and finish. 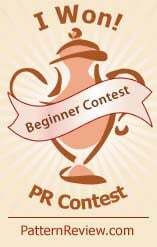 Tomorrow we'll recap our journey, share a few canapes and some Diet Pepsi, and call it a Sew-Along. Have a great day, everybody, and happy stitching! I love the Alan doll! How lucky of you to find such a wonderful set. I can't wait to see him in his outfits. Hey, I like the material. It's not silly, but perfect for spring. 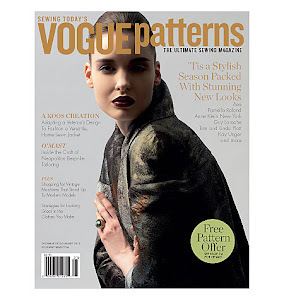 About your shirt fabric being 'silly', different generations, different mores. I have no problem wearing retro kiddie prints as clothing and I'm in my 40s... I made a summer shirt for my husband (soon to be 50, gasp!) with a Heather Ross beach scene fabric. My grandmother was totally baffled by the idea that an adult would choose to wear something 'so childish', whereas my husband absolutely loves it. 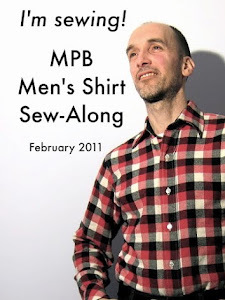 I have enjoyed the Mens Shirt Sew - Along posts and am looking forward to Cathy's return to society. Your shirt looks great! Peter, you look smashing in Negroni 3! I love the fabric and the fit suits you so well. :) I've had to put Negroni aside until summer, but I have all of your posts bookmarked to help me along. I love the Ken case and Allan is quite a handsome fellow! :) Looking forward to the adventure of Ken and Allan! Oh how I love your silly fabric, so much that I may have to get myself some similarly scrumptious cotton lawn. And your Ken & your poochies are too cute, just too cute. I have thoroughly enjoyed the Sew-along, and am please to report that I cut a short-sleeve Negroni for my husband Friday night. I had some silky cotton batiste in black, but alas, no black interfacing. I couldn't pick said interfacing up until after dropping my machine for a tune-up and cleaning (while I will be away on business this week). I'm considering top-stitching the shirt with a contrast thread or maybe running some decorative stitching down the front parallel to the buttons. Maybe ivory?? Not sure...may need to snoop shop for some inspiration. Any thoughts? 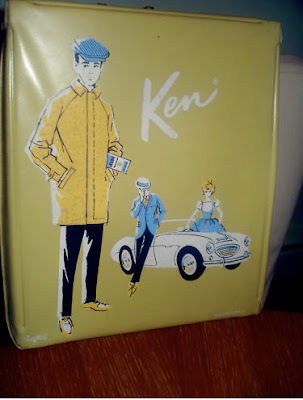 I am very jealous...I have oogled that Ken case on ebay. Me, the girls and Ken are certainly up for a play date. A quick train ride and we are there. Does this mean that Cathy will be wearing the full-skirted pouffy number? Yay! I am behind in the sew-a-long, but have really enjoyed learning lots of new techniques -thank you!! That Ken case brings back memories. I wanted a Barbie case so badly when I was little. (especially with the little hangers!) My parents just didn't understand and wouldn't get it for me. The other toy I wanted really badly (and didn't get) was a Barbie sewing machine. That might explain the eight machines currently in my sewing room. Betty, that used to be an octopus but they pulled all the legs off! 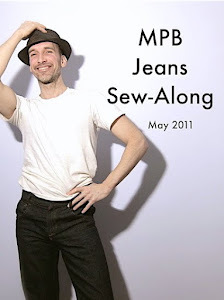 I really like what you're doing and it's very interesting your approach on sewing and fitting.